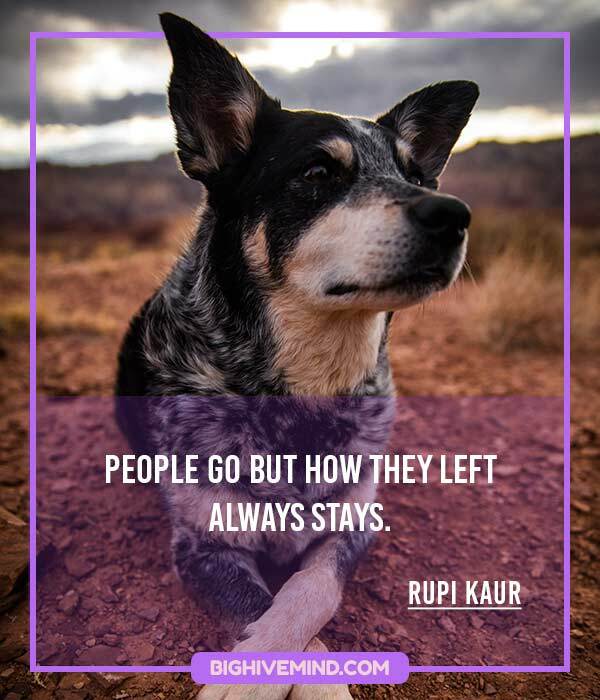 Rupi Kaur is a popular poet and illustrator. Her first book, Milk and Honey, was extraordinarily successful and sold over a million copies. Her second book, The Sun and her Flowers, was released in 2017 and has sold many copies as well. Kaur’s work is inspirational and helps people deal with problems in their lives. Her poetry especially resonates with women, teaching the themes of self love and feminism. Many of her poems have special meaningfor people who are going through a difficult breakup. 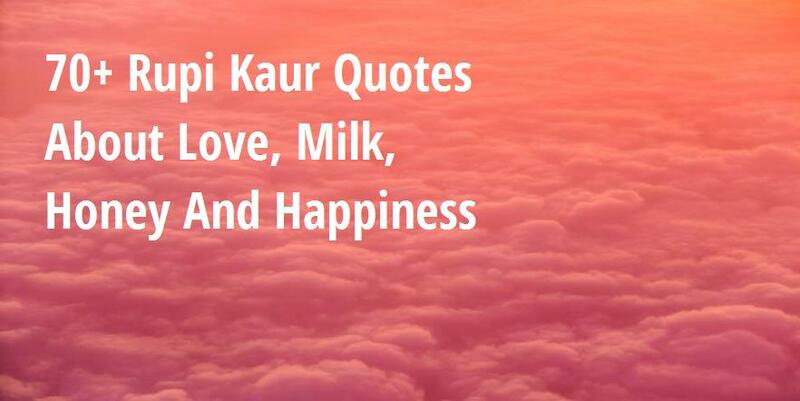 Read these thoughtful quotes from Rupi Kaur and discover the inner beauty in yourself. 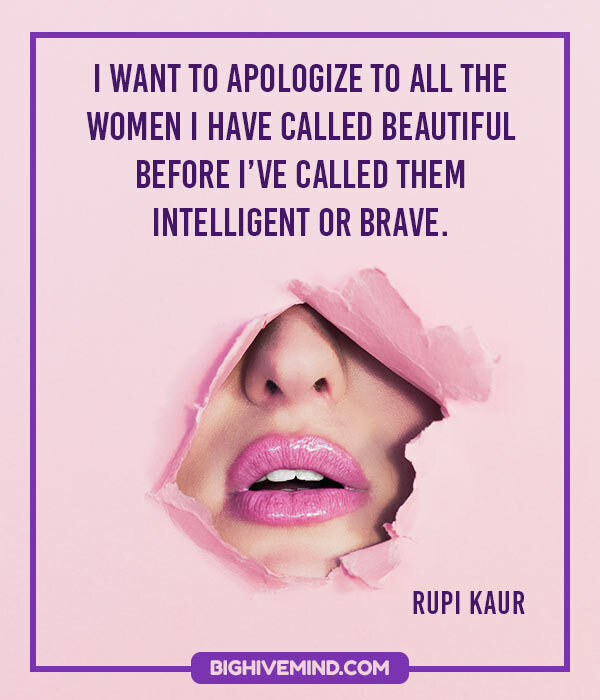 I want to apologize to all the women I have called beautiful before I’ve called them intelligent or brave. People say things meant to rip you in half, but you hold the power to not turn their words into a knife and cut yourself. You were so afraidOf my voiceI decided to be afraid of it too. You look at me and cry ‘everything hurts’. I hold you and whisper ‘but everything can heal’. How do you redefine love when your idea of love is something that’s so violent? When your idea of passion is anger, how do you fix that? I won’t let go cause being alone hurts more than chasing someone who’s left. 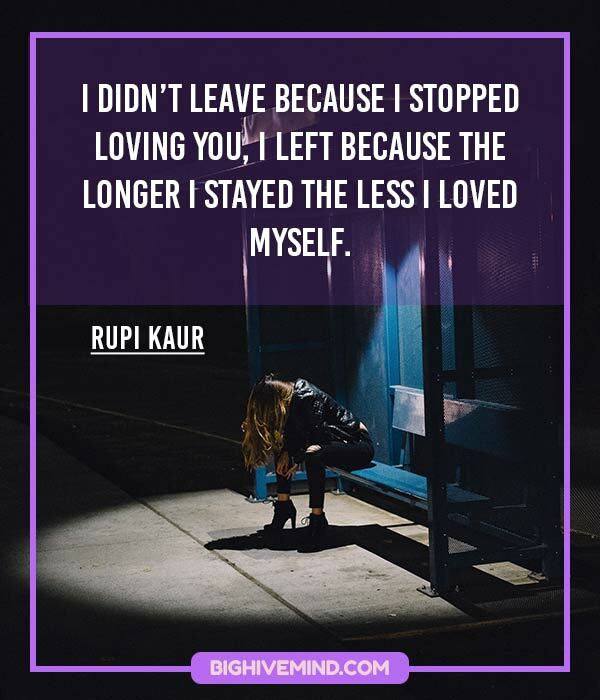 But if you’ve left aren’t I already alone and surviving it? You were so distant I forgot you were there at all. 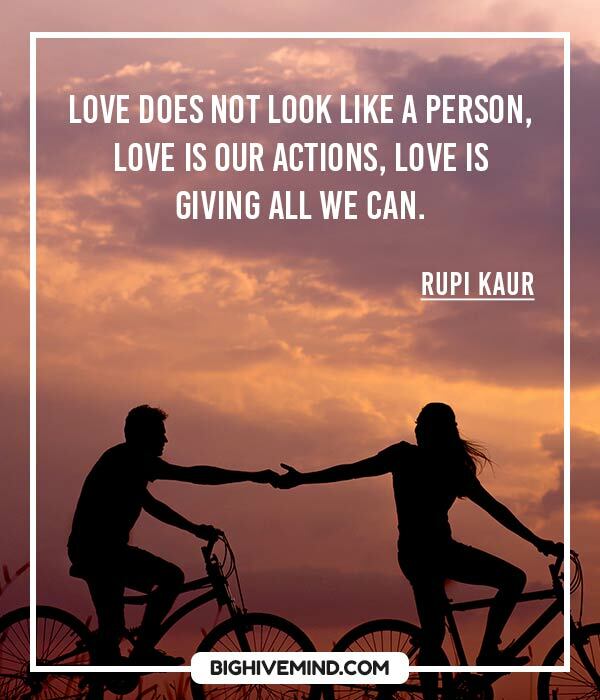 Love does not look like a person, love is our actions, love is giving all we can. You may not have been my first loveBut you were the love that madeAll the other lovesIrrelevant. They leave and act like it never happened. They come back and act like they never left. I am timid cause falling into you means falling out of him, and I had not prepared for that. how can she love a man who is busy loving someone he can never get his hands on again. Loving you was breathing, but the breath disappearing before it filled my lungs. Really, at the end of the day, the only thing you can control is yourself; the only person you can truly educate is yourself. You have to redefine what beauty is to you so you can’t be affected by what people are saying. I don’t fit into the age, race, or class of a bestselling poet. the art of smiling and nodding when someone brings their name up in conversation. With immigrant parents, they’ve had to sacrifice so much to survive, and they’re trying to preserve the culture they lost, so there are just so many boundaries. be a sad replacement of the woman you let slip. nothing she does will excite you and this will break her. Just because someone tells you they love you, it doesn’t mean they actually do. My heart is beating, and I’m breathing, and nothing anybody has ever done has changed that. i am your daughter. i know the small talk is the only way you know how to tell me you love me. cause it is the only way i know how to tell you. That is the thing about selfish people. They gamble entire beings, entire souls to please their own. Truth, honesty, empowerment – it’s what I want for myself and my readers. But if you had not stuck a knife inside me and walked away how would I have learnt people do not die from wounds caused by other people. People die when they forget they are more than the pain. I grew up thinking I was going to change the world, but not because I was treated like a special snowflake. It’s a silly label. People are starving. We need to feed them. That’s the end of the conversation. The kindest words my father said to meWomen like you drown oceans. The universe took its time on you. Crafted you precisely so you could offer the world something distinct from everyone else. So when you doubt how you were created you doubt an energy greater than us both. The very thought of you has my legs spread apart like an easel with a canvas begging for art. I will never understand why you held me if you were afraid of warmth. You should have known I was a fire. I don’t know what living a balanced life feels like. When I am sad I don’t cry, I pour. When I am happy, I don’t smile, I glow. When I am angry I don’t yell, I burn. The good thing about feeling in extreemes is when I love I give them wings, but perhaps that isn’t such a good thing cause they always tend to leave and you should see me when my heart is broken. I don’t grieve, I shatter. Growing up, I naturally embraced who I was, but I was always battling with myself. So I spent half my time being proud of being a woman and the other half completely hating it. What’s it to me if you love me or miss me or need me when you are doing nothing to be with me? If you can’t allow me to be the love of your life I will be the loss of your life instead. I will not have you walk in and out of me like an open doorway when I have too many miracles happening inside me to be your convenient option. You have sadnessLiving in placesSadness shouldn’t live. It felt like you threw me so far from myself, I’ve been trying to find my way back ever since. When things get better, there’s a swing to the pendulum where things get worse for others. Isn’t it such a tragic thing when you see it so clearly but the other person doesn’t. The night after you left I woke up so broken the only place to put the pieces were the bags under my eyes. I do not want to have youTo fill the empty parts of meI want to be full on my ownI want to be so completeI could light a whole cityAnd thenI want to have youCause the two of us combinedCould set it on fire. Feeling ‘ugly’ or ‘unattractive’ seeps into your life like poison, and it affects everything. Feeling worthless does the same. We internalise these limitations, and it takes an internal revolution to get rid of them. I don’t know whyI split myself openFor others knowingSewing myself upHurts this muchAfterward. You’re beautiful’ was the compliment I craved so much. I didn’t care if people called me smart or innovative – it was the number-one compliment I gave out to other women hoping it was given back to me. I heard people saying it to my best friends. It was the one I wanted to hear more than anything else. Don’t mistake salt for sugar, if he wants to be with you, he will, it’s that simple. When the phrase ‘I’m sad’ becomes synonymous to ‘I won’t be okay’ you realize how much it hurt beginning to end them coming, them staying, them leaving was like preparing your body for death. The funeral that came too early and never left. The world gives you so much pain and here you are making gold out of it — there is nothing purer than that.